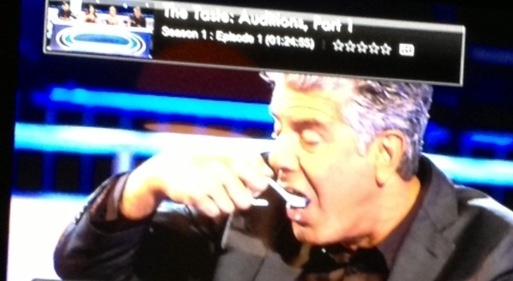 I finally had some time the other night to start catching up on Bourdain's network show The Taste on Hulu Plus. I like it! It's a great cast. 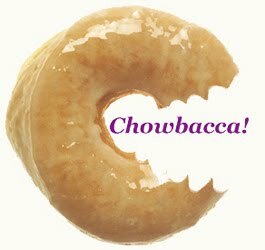 It's a great concept for a food competition show, although I've read that it is a clone of NBC's The Voice. I don't watch this kind of show, or much television other than baseball, so I couldn't say. All I know is that I'm two episodes in and no one has sung a note or mentioned The Ramones ad nauseum. Bravo! So, the show: Professional and home cook contestants prepare one spoonful of food for Bourdain and each of his panel of professional and home cooks. The panelists know nothing of the contestants until they have tasted their spoonfuls and have decided if they want the contestant on their team for a cooking competition that will take place over the following episodes. When each contestant is revealed they are either informed why no one on the panel chose them or they are chosen by one or more panelist. If chosen by more than one panelist the contestant gets to choose which panelist's team they would like to join. 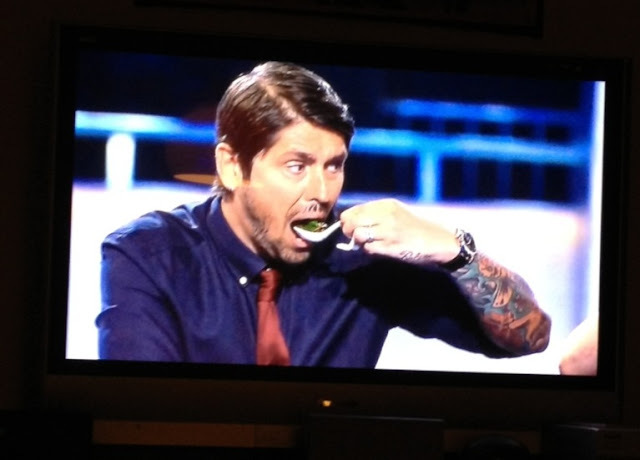 When the competition gets going there will be mentoring, spoonfuls, judging and going home. Sorry that this wasn't exactly a bite-sized synopsis. If you can do better quit reading blogs and go pitch some shows, smart guy. The celebrity panelists/judges/team builders/mentors, along with Bourdain, are San Diego restauranteur Brian Malarkey, writer Nigella Lawson and French chef and cable show cook Ludo Lefebvre. 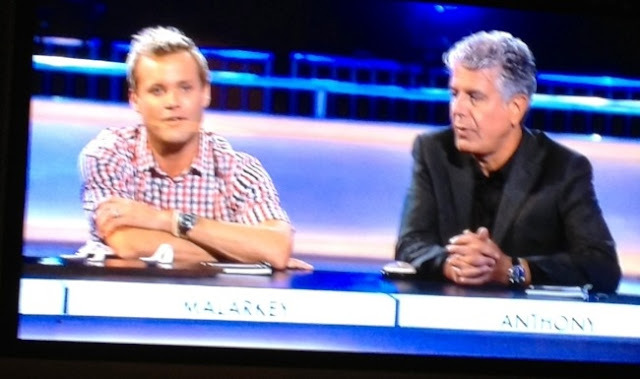 I've never seen Top Chef, but apparently Malarkey and Lefebvre were both on versions of it. So far I'm enjoying the chemistry of the group, although Ludo is really difficult to understand through all of that French accent at times. And, am I nuts or do the celebs' personalities mirror sweet (Nigella), salty (Malarkey), sour (Lefebvre), and bitter (Bourdain, who else)? Now that the panelists have picked their teams I'm excited to see how the teams work together, or don't, and how the competition plays out. Having seen and enjoyed most of Anthony Bourdain's previous shows I'm expecting more good things from The Taste. UPDATE: I've caught up with The Taste, having watched everything up to episode five, and it has been a blast. The two episodes of elimination/team building were just appetizers. The entree has me rooting, cheering, booing, hissing, and laughing out loud, (I don't lol). I've even changed allegiances in some cases. I'm not spoiling by saying who, but when ten people tell you that something needs salt, you ask for the salt. Sure, there's a lot of annoying "mememe" behavior from the contestants. Yes, it's a mix of every television cooking competition convention including elements lifted from the classic Iron Chef to, well, you name it, but the celebrity mentors seem to be having a lot of fun and I am too. I'll keep watching. Cue the frantic string section! "Can you believe this guy took pictures of his TV with an iPhone? Yeesh." The Taste airs on ABC Tuesday nights at 8 Eastern and Pacific, 7 Central. The Dottore's money is on Khrystianne. Rather, Gregg. Three "G's"? Really?